The early 2011 X3s were generally seen as a best-in-class move forward and the 30D M Sport re-up delivers an almighty zip and the kind of tight drive that you'd expect from a smaller car.It also does with better emissions and fuel economy than rivals with similar spec, such as the Freelander 2 SD4 and the Audi Q5 S 3.0. A hearty well done. barrel past traffic at 210kph. But in the xDrive30d spec seen here, you get a 3.0-litre, straight six, common-rail unit made out of aluminium and complete with a zero-maintenance particle filter. In English, that translates to an in-line, six cylinder, lightweight and robust engine that only your service centre mechanic will ever come face-to-face with. Even if you do, visually it doesn’t look different from its smaller sibling. But in terms of specs, the number of horses has increased by a massive 74bhp. Raw torque has soared by 180Nm. Even better, all this is at about the same engine rpm range. The result is a sprint to three-digit speeds in a claimed 6.2 seconds and a top whack of 230kph. Importantly, getting there is easy work, which makes the X3 30d a serious player of the fast lane. The eight-speed Steptronic gearbox, which is optional on the 20d, is standard fare here. It’s a complex piece of kit designed to save fuel with the same gusto as it has to help propel the car better. It tries hard, and with reasonable success, to understand individual driving styles and makes split-second decisions to keep you in the right gear. Does it work? Not flawlessly, as it takes time to understand what’s on the driver’s mind via the right foot. Thankfully, this BMW is an SUV and you will never be on a racetrack to rue lost microseconds. So, in everyday practical terms, it does work well. Typically, there are three driving modes to choose from – Comfort, Sport and Sport+. In Comfort, the ride is pretty choppy and at slow speeds the X3 can rock like a boat. Which is good if you want to go to sleep. But if you are driving, change to ‘Sport’ because that’s where it firms up the ride without being harsh on your body. The car feels much more stable here. The engine revs higher though, and in slow traffic you wonder whether you are stuck in the wrong gear. Thankfully, you can individually switch off Sport mode, either for the drivetrain or the chassis, which sort of solves the rev noise problem. Enhancing driving pleasure and so much more besides: BMW EfficientDynamics represents a suite of intelligent technologies that markedly reduce fuel consumption and emissions while simultaneously boosting the performance of the BMW X3. The underlying principle is very straightforward: minimise waste, maximise energy use. 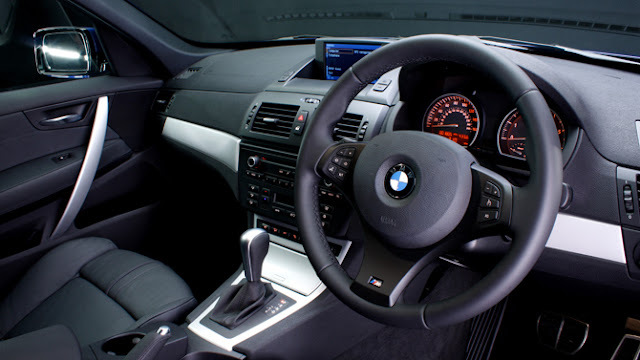 Brake Energy Regeneration, for example, charges the battery with the power produced by the engine when the BMW X3 is coasting or braking, freeing power output for acceleration. Other innovative measures include electromechanical power steering, tyres with reduced roll resistance and precise aerodynamic design. The engines of the BMW X3 feature performance-boosting technology such as the patented Twin Scroll turbocharger, petrol direction injection or diesel common-rail injection, and extract even more power from even less fuel. Less CO2 emissions, more driving pleasure: this is BMW EfficientDynamics. BMW TwinPower Turbo straight six-cylinder petrol engine xDrive35i. How do you improve a power unit that's won the "Engine of the Year" six times? With a Twin Scroll turbo charger, Valvetronic and petrol direct injection. And that's just the beginning. The improvements in each detail are evolutionary: each of the three technologies has been enhanced in specific ways. What's revolutionary is the way they all work together. In the BMW TwinPower turbo in the BMW xDrive 35i, they have been completely integrated with each other, creating a remarkable new unit. The result: 225 kW (306 hp), 400 powerful Newtonmeter across a broad range of engine speeds, and smooth power delivery. And all by consuming just 8.8 litres petrol per 100 km. Quiet, comfortable running and excellent performance are also characteristics of the straight six-cylinder engine in the BMW XDrive28i. With its cylinders lined in Alusil and crankcase constructed from magnesium, it's one of the lightest six-cylinder engines in its class, boasting 190 kW (258 hp) and 310 Nm torque. Its advantages are not limited to its dynamic performance: it consumes just 9.0 litres per 100 km. "My goal was to create for the all-new BMW X3 a 'dramatic vibrancy' of light and shade emphasizing the form and definition on the surface with new bold X-ness." Erik Goplen, BMW X3 exterior designer. "As a designer, I've always been greatly inspired by natural occurrences, such as ice floes. Translated to the interior design, a volume concealed beneath a soft, almost organic skin erupts and thus demonstrates a living modernity." Ulrich Ströhle, Interior Designer BMW X3. Spaciousness: it's your immediate impression upon entering the BMW X3. It's a result of your higher seating position and the remarkable room to move that you enjoy in the BMW X3 – shoulder room, leg room, head room. Parallel to the horizon, the lines of the instrument panel draw your gaze to the distance. Vertical lines cross the instrumental panel and direct your focus to the driver's carefully designed workplace. Every detail is precisely crafted in materials of outstanding quality and carefully selected colours. Together, they make the clear statement: sitting here, you can go anywhere. Don't just take what you need. Take what you want. The BMW X3 has the room to accommodate your life and the way you choose to organise it. What makes a perfect summer's day? Pack the cooler with a few chilled sports drinks and connect it to the 12-volt power outlet in the boot to keep them cold. Fold the 40/20/40 rear seat to make room for your gear. Suddenly, the luggage space expands from 550 litres to up to 1600 litres. Lash down your BMW Mountain Bike using the restraining hooks in the boot, and let the navigation system guide you to the excelling downhill route you found online. Once you arrive, simply unload the bikes – your valuables are safely concealed under the second loading bay floor. In winter, the ski and snowboard bag has capacity for up to four pairs of skis or three snowboards, keeping them clean and safely in place between the left and right rear seats. After a long day in the snow, the BMW X3 offers a spacious, comfortable haven, with many functional details, for up to three additional passengers. From cool music to hot coffee, all your favourite things find a place in your BMW X3. Thanks to its intelligent storage concept, you know exactly where to find your umbrella, your sunglasses or your ice-scraper when you need them. And in the meantime, they're safely stowed. The BMW X3 has a place for everything. For example, for 1.5 litre water bottles, which slip effortlessly into the front door pockets. Sunglasses, wallets and mobile phones find a perfect spot in the compartment under the armrest, while the extra-large coffee-to-go fits perfectly in the cupholder in the central console – without impeding your access to the gear select lever or iDrive. Roadmaps, the owner's manual and CDs are at home in the spacious glove compartment. Space to work, play and read: the optional folding tables in the rear are attached to the Travel & Comfort system mounts, which themselves are attached to the driver and front passenger headrests. The tables can be folded up or removed with ease. The height and angle of each of the stable work surfaces is individually adjustable, and the integrated cupholder ensure drinks stay where you put them. For even more convenient and clever storage solutions, the optional storage package features a number of luggage nets, extra compartments, and two additional cup holders in the rear central armrest.